An end piece of Bacon-Wrapped Meatloaf, with the requisite greens. Meatloaf is fun to make. Take some ground meat, throw in some bread or cracker crumbs, some chopped onions, and some other spices. You can then bake it as a loaf, grill it as burgers, or bake off individually-formed servings for buffets or catering. It’s simple, filling, and satisfying, and different versions go well with a large number of sides. 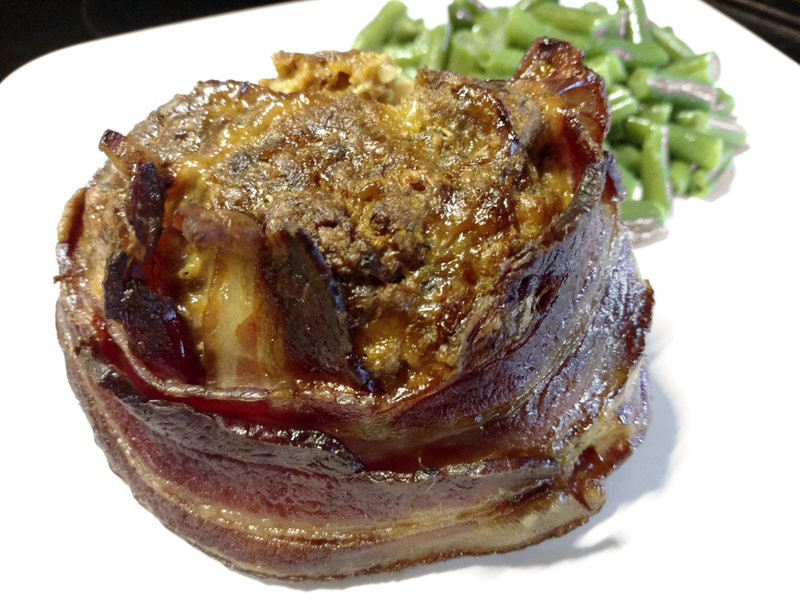 At Mary’s request I’ve recently been focused on variations on Bacon-Wrapped Meatloaf. Her boss was going to have surgery and I, turning into my mother and doing what she would have done, offered to cook a few meals to get the boss and her family through about the first week. My selections were my Chicken Noodle Soup, a simple BBQ pulled pork from a slow-cooked shoulder (along with the necessary buns), and a good meatloaf. 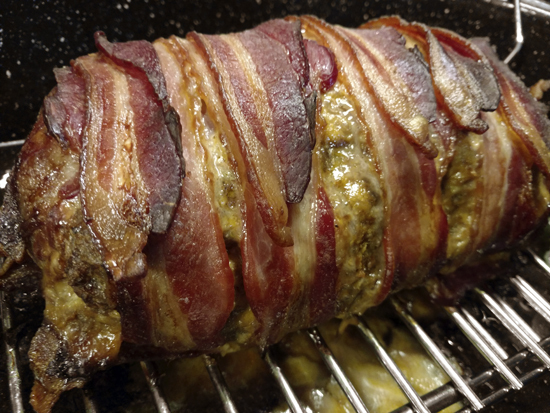 While I was putting the meatloaf together, that’s when Mary suggested wrapping it in bacon. Because of the size of the family, that first meatloaf weighed just over six pounds. There were two lbs each of ground beef, sausage, and bacon, along with half a box of saltines, eight eggs, and the seasonings. I’ve since settled on one lb each for the basic recipe, while ensuring the recipe itself is truly scalable for larger needs. But there are a huge number of possible variations. Choice of meats can vary, but pork and veal seem to be one of the standard combinations. Groceries sometimes sell that combination on a foam tray, while others add beef as a third meat in the same package. Combining beef with lamb would give a good flavor, with the beef needing a higher fat content to give a good juiciness. Combining goat or other meats with beef would be interesting as well. Ground turkey or chicken? Sure, if you’re into that kind of thing. The basic recipe presented here, outside of the bacon wrapping, is rather generalized. Change the meats, change the spices, use applewood or hardwood smoked bacon, wrap it in prosciutto if you’d like … Whatever. Be creative. The trick, though, is to slow-cook the loaf, particularly if it gets rather large through scaling the recipe. At some point though, making multiple smaller loaves makes more sense. Just have fun with it. I certainly do. Add all but the bacon, onion, and crackers to a medium mixing bowl. Peel and coarse-chop the onion and add it to the bowl. Put the crackers into a gallon plastic food bag, and roll with a rolling pin till the crackers are fine crumbs. Add the cracker crumbs to the mixing bowl. Don’t mix what’s in the bowl yet, just set it aside. Preheat an oven to 250F. Grease a small cooking rack and set it in a roasting pan, deep casserole, or enamel pot. Lay two slces of bacon next to each other in the middle of the rack.Lay the other slices perpendicular to the first two, five on each side, side-by-side, with the inside end at the far side of the first two slices. If you have more than these twelve slices of bacon, add four more slices, two on each end, to extend the length of original two slices. Use your hands (with food-handling gloves if desired) to fully mix the meat mixture. Form it into a loaf, which will be about 7 inches long and just over 3 inches in diameter. Lay the loaf in the middle of the bacon over the first two slices. 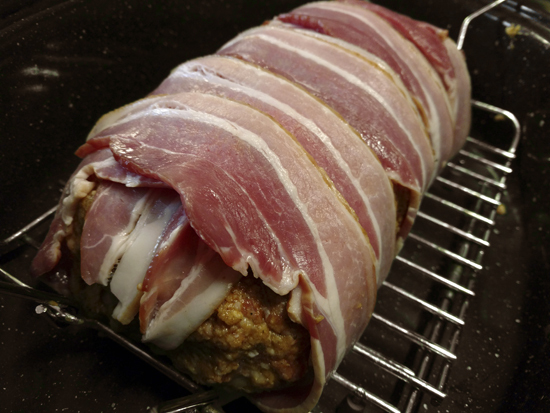 Then, pick up the rest of the bacon piece-by-piece and fully wrap the loaf. Cover the meatloaf, and bake in the 250F oven for three hours or until a meat thermometer inserted into the center of the loaf reads 160F. Then go ahead and bake it for one more hour to crisp the bacon. Remove the loaf from the oven and allow it to rest before slicing with a serrated knife and serving.